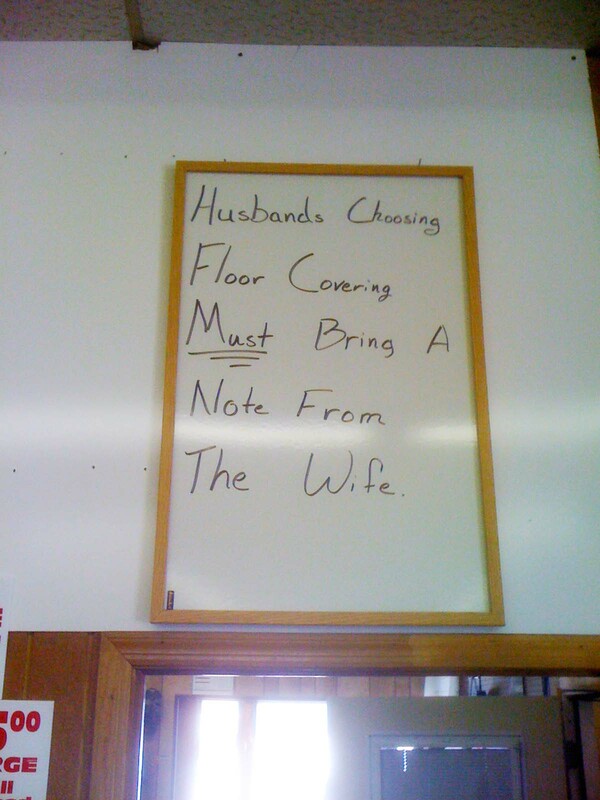 Husbands, please note. 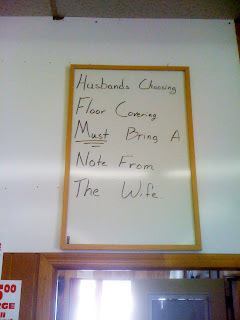 If you are choosing floor covering, you MUST bring a note from the wife! 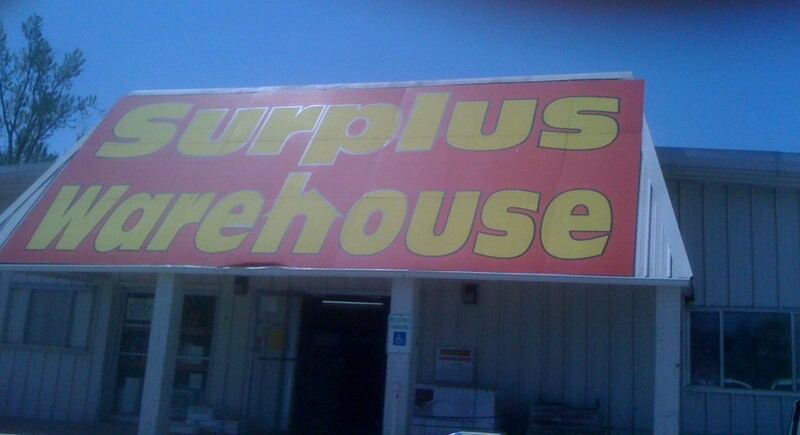 So says this sign in the Surplus Warehouse that Paul Friederichsen from Brand Biz stopped in while traveling in Springdale, Arkansas. Priceless and simply perfect, don't you think? "I stopped in a small closeout warehouse chain that sells odds and ends, as well as some assorted laminate and tile flooring. I spotted the sign hanging above the door and had to share. This says it all, doesn’t it?" But, I'd love to hear your thoughts. Do you have other simply perfect examples of retailers who demonstrate that they understand their in-store customer dynamics? Applying Local Insights To Your Brand Experience. The value that a brand offers customers has a lot to do with relevance. On a national level, that includes consistently meeting expectations about quality and experience. Relevance creates meaning. The more meaning, the more relevance and the stronger the brand, no? How then to become more relevant? To become the 'global authority' in lawn and garden care, Miracle-Gro has decided to focus on local needs as described in Scott's Miracle-Gro Amps Up Local Marketing. As a result, two marketing iterations have become 17 to take into account different climactic zones and demographics. Proactively thinking about the repercussions of natural events [e.g., widespread flooding increases the likelihood of fire ants in certain parts of the country] has allowed Miracle-Gro to anticipate and better help customers - creating a great deal more relevance! The article mentions other examples: creating a seed that will withstand the major barrier to lawn success: underwatering as well as goof-proof fertilizing solutions. All the result of better listening and observing for local insights. By the way, Scott's Miracle-Gro has created a rich community page with discussion forums, blogs, photo-sharing, ask the experts and newsletters. Ace Hardware discovered an opportunity to improve its visibility among an important demographic: Hispanics. Ace Hardware Opens Door to 'La Ferreteria' describes how the company evolved from translating Anglo-campaigns to internalizing that the hardware store holds a different meaning for Hispanic families: it is the center of a community, a place where one can find helpful resources. Home improvements are opportunities for family bonding and teaching life lessons. Talk about valuable insights! What a marvelous opportunity for creating significant meaning! Inside Best Buy's Customer-Centric Strategy reminds us that Best Buy, by becoming more customer-centric, realized that it wasn't connecting with the source of 55% of its purchases: women! It began bundling related products together in the store and offering installation assistance [via the Geek Squad] based on the insights gained from paying closer attention to the dynamics of its local customers. Yes, it takes effort. And a strong desire to become customer focused. But isn't it fascinating to read about the kinds of insights that these brands have had simply by paying attention to local marketplace dynamics and then thinking about how to create meaning and be more relevant to customers? I bet you've had similar A-Ha moments resulting from local insights. Would you share them with us? I'm pleased to share with you the latest issue of my Simple Marketing Now Flooring eNewsletter! Comments, feedback and suggestions are welcome! Based on discussions at Surfaces, many of you are experimenting with and implementing new approaches for connecting with customers. Which are you having the most success with? How are you adapting the rest of your business strategy to take into account your successes? I’d love to hear your stories. 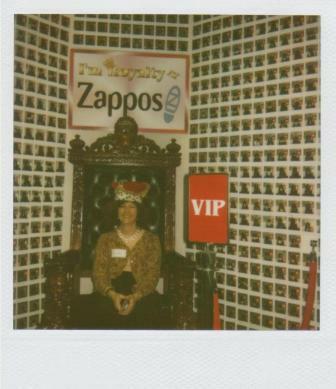 By the way, my visit to Zappos HQ during Surfaces has so far inspired one Floor Covering Weekly column – “Powered by service” - and two blogposts – Zappos & Service and Zappos Embodies Customer Service. 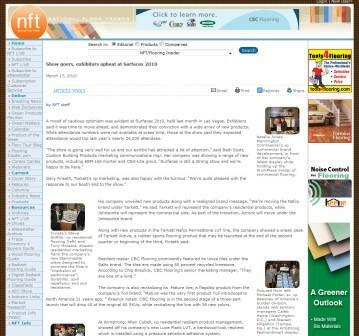 The Carpet and Rug Institute Blog just celebrated its first blog birthday! Please join me in congratulating Bethany Richmond, James Beach and all of the CRI Blog contributors. In the latest update to The DOMOTEX Blog, Katherine Léon announces an event being held in Dalton, GA on 4/27/10. Titled Expanding Your Flooring Business In The International Marketplace, it features industry experts. For more information about the workshop, click on this link. The Social Flooring Index is being updated. So far, Twitter and Facebook listings for April 2010 are available. If you notice any accounts missing, please let me know. The Floor Covering Institute Blog welcomes new members Donato Pompo and Ruud Steenvorden. Care to practice your Twitter skills? Join @DaveTalkFloor and @CBWhittemore on Twitter. Use #TalkFloor to ask questions. Or, simply listen to our TalkFloor interview series. Click on this link for information – including show notes – on the first two segments: What is Twitter & Why Should I care? Then, when you’re ready, let me know… and we can tweet! How do customers find you? How do you connect with them? How do you ensure that customers find you and your business? Once they have found you, how do you go about connecting with them? The solution calls for plenty of traditional elements – from talking to people ‘belly to belly’ as Big Bob’s Scott Perron says, to ensuring that your brand is relevant to your audience as Brand Biz’s Paul Friederichsen urges. It also calls for digital and social solutions to reach customers where they increasingly spend time – online, on social networks – doing research in anticipation of making purchase decisions. That’s what Scott, Paul and I will address at Coverings 2010 in Orlando on Friday 4/30/2010 from 8:30am to 11:30am when we present Marketing in a Recession 101. We hope you will join us! Click here to read the Coverings press release. Other happenings in Orlando: The Luxury Marketing Council Orlando has invited me to discuss marketing to women, the retail experience and developing community in a presentation titled “Flooring The Consumer: Developing Community & Delivering Wow!” on 4/28/2010. Click here to read the press release. Continuing on where I left off in my post Zappos & Service, it's fascinating to encounter a company that literally treats customers like royalty because its commitment to customer service is so strong. So how does a company go about embodying customer service to such an extent? How do words like "powered by service" come to be more than just a tagline and instead a standard that all employees defend fiercely? Brandeo's Brands: Zappos Brand Based on Great Service Not Lip Service states that "Zappos’ success demonstrates some of the key characteristics of a strong brand: Leadership’s passion for the brand, an unwavering focus on delivering the brand, and a culture that reinforces each employee's responsibility for the brand." From what I have observed, those three elements - leadership, focus on delivering the brand and strong consistent culture - absolutely make "powered by service" more than just words. Take this AdAge article from 10/20/2008 titled Zappos: Customer Service First -- and a daily obsession. It makes interesting points. The customer service approach means that 75% of Zappos' sales come from repeat customers. "It's just a lot cheaper to get existing customers to buy from you again than it is to try to convince someone new," says Tony Hsieh, Zappos' CEO. Music to my practical marketing heart! Success calls for ensuring that all Zappos employees feel as passionate about customers as Hsieh does. That's why each one, regardless of position, goes through a four-week customer-loyalty training session that includes answering phones and interacting with customers. 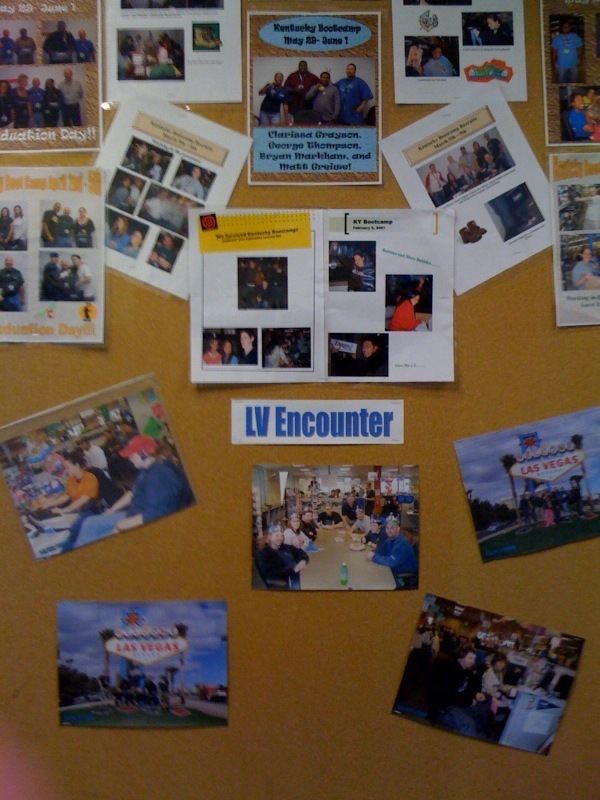 The picture here with the caption "LV Encounter" captures one such session. Another interesting point: "Zappos employees must check egos and competitiveness. Customer-service reps are trained to look on at least three rival websites if a shopper asks for specific shoes that Zappos doesn't have in stock... We're focused on building the lifelong loyalty and relationship with the customer." Do your employees do that? 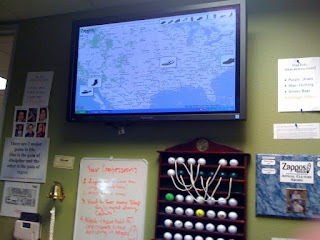 And, do you prominently display how to get in touch with your customer service reps to customers? Check out these customer service stories in 12 Lessons From The Best Customer Service Companies. 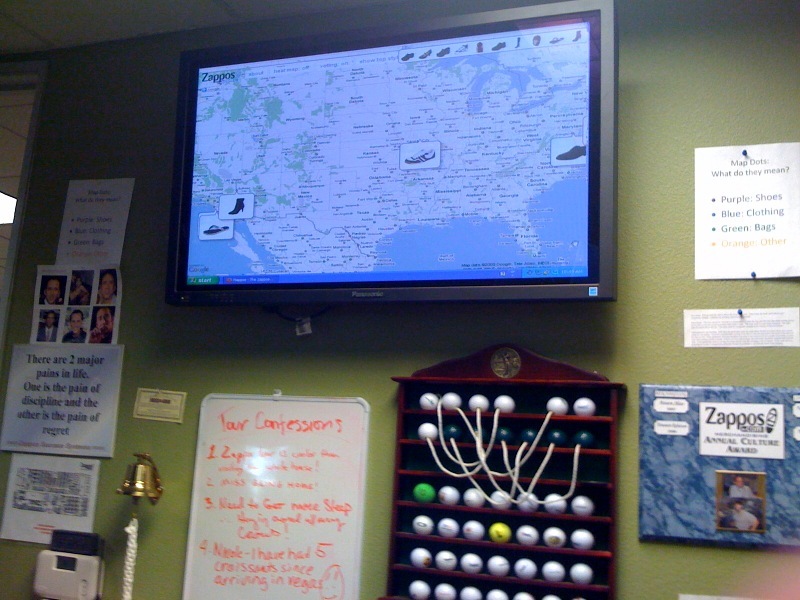 Note Even Online Retailers Need Phone Support: Zappos. What's your reaction to all of this? Do your employees passionately believe in your commitment to customers? How do you get everyone on the same page? How do you stay focused? In May 2009, I contributed the following article to Personal Branding Magazine Issue No. 8 Re: Female Power Brands. Many of the ideas are ones that I've been revisiting as I think about organizations that are particularly successful at 'flooring' their consumers. I welcome your reactions. There’s an interesting confluence of forces at work suggesting that effective branding is shifting from traditional, hierarchical and interruption-based notions [i.e., left-brained or male] to connected, adaptive, social and conversation-based notions [i.e., right-brained or female]. Think Ford Motor Company hiring someone dedicated to facilitating conversation [i.e., Scott Monty] or Fiskars, the scissors company, creating the Fiskateers, a community of brand evangelists – both right-brained branding strategies. Right-brained personal branding results from a carefully woven tapestry that integrates person and profession, includes personality, celebrates individual passion and welcomes interaction to help the identity evolve against carefully determined values and priorities. Right-brained brands consider ideas in terms of ‘us,’ ‘it depends’ and nuances rather than absolutes. Left-brained brands, on the other hand, prefer absolutes, focus on an ‘I’ or ‘me’ perspective and dictate behaviors. They appear rigid. Now, we all – men and women alike – represent a combination of both approaches, in different degrees. However, as David Wolfe outlines in his book Ageless Marketing –premised on the majority of the population, as it is now, being over the age of 40 – as we get older [and wiser] our brains become less categorical, more interested in context, more about shades of grey, more right-brained [and female] in how we process information. Our maturing brains – regardless of gender – look for connections and true-ness [i.e., authenticity]. We seek out values relevant to us as we look to ‘self-actualize’ to use Abraham Maslow’s notion of transformation and personal improvement. Interestingly, this affects and inspires younger generations – helping to explain the renewed civic-mindedness we are witnessing with record Peace Corps and Teach For America volunteers. In the workplace, although hierarchical left-brained business models remain well entrenched, we’ve started to see traditional hierarchies replaced with flatter, leaner, more cooperative structures. Command-and-control has morphed into spheres of influence where as individuals we must figure out how to provide value for the greater good rather than selfishly extracting it. Add to that the tools of social media which enable the individual to express personality, share wisdom and demonstrate undeniable passion. Those same tools require that corporate brands show personality and individuality, that they become porous and malleable to evolve and remain relevant. These brands have the opportunity to express a right-brain attitude, become social and connect with core constituents. As we individually commit to participating in the marketplace in a public way, we must establish a credible and memorable presence or brand to stand out and be noticed. Too left-brained an approach signals inaccessibility and rigidity, even eventual commoditization. A right-brained approach, however, welcomes and interacts socially, demonstrating sufficient confidence to invite perspectives and offer value. The personal brand evolves and remains relevant. My business self includes many left-brained aspects – e.g., meticulous, results-oriented, practical. My right-brained aspects complete and complement my personal brand, keeping me receptive to change and nuance. I’m fully engaged in a rich, interactive and ever-evolving journey. Are you ready to express your right-brain self, your right-brain personal brand? Note: Special thanks to Susan Abbott, Toby Bloomberg and Andrea Learned for contributing inspiration and perspective for this article. National Floor Trends, in its March 2010 issue, did a recap of Surfaces 2010 in "Show goers, exhibitors upbeat at Surfaces 2010." Did you see it? The article includes a fascinating [!] section titled "Selling to women a focus of educational courses". Can you imagine why that section caught my attention? In addition to addressing a topic near/dear to my heart, I was really excited to discover that my Surfaces presentations were included in that section. More specifically, my Social Media 101 session. "Social marketing and the role of female consumers were big topics during Surfaces 2010. Patricia Flavin, Beaulieu of America’s sr. vp. marketing, led “Marketing to the Ultimate Power Consumer: Women,” offering tips on targeting female consumers. Christine Whittemore, of Simple Marketing Now, taught “Social Media 101,” a course which included an overview of popular online tools such as Twitter, Facebook and blogs. Flavin said 92 percent of decorating purchases are made by women, making it essential that retailers ensure their stores are women-friendly. “If your store is cluttered with too many things just strewn about, you will lose her business. Look at your store from an outsider’s perspective, and fix things that aren’t right,” she noted. Whittemore added that 84 percent* of social media users are women. “To appeal to women, you must present yourself or your company in an information-offering mode, in-store and especially online.”"
Many thanks to Arpi Nalbandian, editor of Tile Magazine, for attending my session. I really enjoyed meeting her in person and look forward to seeing her at Coverings 2010. If you attended Surfaces 2010, what did you find most inspiring? March 2010 Simple Marketing Now Update! More specifically, March 2010's blogposts included Social Media Marketing Resources, Simple Fun and Simple Marketing News. The biggest news has to do with Simple Marketing Now's one year anniversary: Simple Marketing Now Turns 1! Next, that the next edition of Age of Conversation 3: It's Time To Get Busy! [i.e., AOC3] is due out in April 2010. Work is already underway for Anticipating Surfaces 2011. Last: Press Release: Whittemore Raises Bar in Social Media Marketing Expertise. I have many social media marketing resources to share with you: a new #TalkFloor Series on Social Media; I'm attending BRITE '10: Will You Be There? Day 1 was outstanding; I expect Day 2 to be equally informative. Here's a post about The Benefit of Facebook Fan Pages. I wish you a most inspiring April!